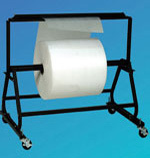 Riverside Paper Co. has roll storage stands to fit your roll storage and roll dispensing requirement. We have roll dispensing stands that will fit a rolls widths of 24" to 72" and with roll diameters up to 40". Riverside can also custom make a roll storage unit to fit your exact requirements. Our floor roll stands are available with casters to make these portable roll stands just right for moving around your warehouse packing areas. The wall mounted roll storage dispensers are ideal for packing areas with limited floor space. Choose the roll storage unit to fit your exact needs or call us to make it just right for you. Roll storage systems can be designed for your facility. Roll Dispensers are available with cutter bars. Rolled material storage rack designed for heavy material can be made to your specifications. Idea as a bubble dispenser stand. Mobile bubble dispenser stand done by simply adding our caster kits. 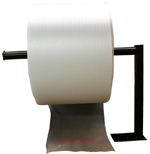 Put Kraft Paper on our roll dispensers with a cutter to increase productivity.